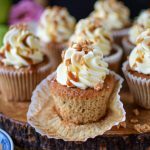 These caramel apple cupcakes are the perfect embodiment of Autumn. 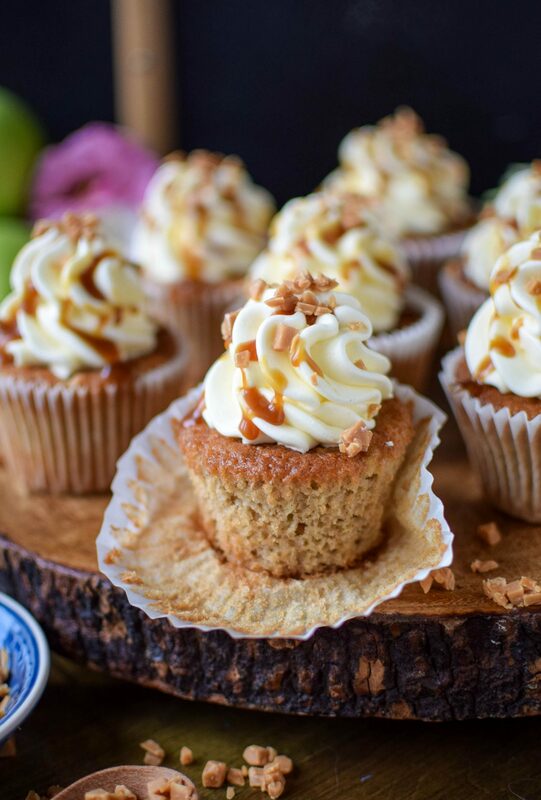 A sticky maple sponge filled with cinnamon spiced apples and topped with a caramel drizzled maple buttercream. I’ve gone a bit Autumn mad recently, the second the slightest chill hit the air I was elbow deep in my spice drawer digging out the cinnamon and ginger. Prepare for an overload of apples, pumpkin and all things cinnamon on the blog for the next few weeks. In fact, I’ve got a few pumpkin spiced breakfasts to share with you guys soon. Sorry, not sorry! 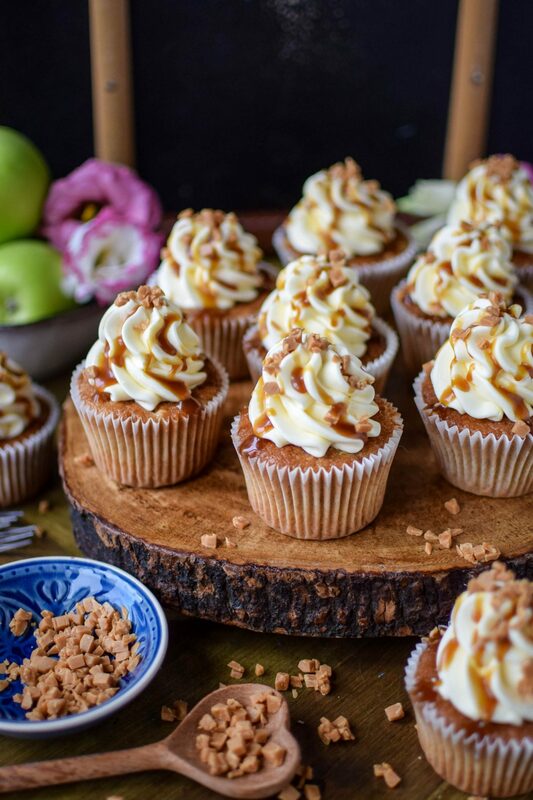 These caramel apple cupcakes are the perfect way to welcome in the Autumnal vibes. They’re perfectly spiced, slightly sticky and oh so indulgent. They’re my absolute favourite Autumnal bake and something I get requests for year after year. This year I’m going to throw myself head first into the seasonal festivities. Every year I fall into the same trap of putting my pyjamas on the second I get home from work and settling down with a cup of hot chocolate. I mean, that’s nice and all, but I really want to more out of Autumn this year. So far I’ve got a few scare mazes planned and I’ve booked myself a table for an Octoberfest feast at The Broad Chare in Newcastle. I’m very excited, I’ll be sure to share the evening with you guys here. I just wish Pumpkin Patches were more of a thing in the UK, how magical are they?! What are your favourite Autumnal things to do? I’d love some inspiration. Preheat oven to 175°C and line a 12 hole cupcake tray with paper cases. In the bowl of an electric mixer beat butter and sugar together until light and fluffy. Add the eggs, beating well between each addition followed by the flour, cinnamon and maple syrup, mix until all the ingredients are combined. Stir through the grated apple. To make the frosting mix the butter in the bowl of an electric mixer until pale and soft. Add the icing sugar, syrup and milk. Turn the mixer on low and gradually increase the speed. Whip for 5 minutes, if the frosting looks too stiff add a splash more milk until you reach a nice piping consistency. Once the cupcakes have cooled fill a piping bag, fitted with an open star nozzle with the maple syrup frosting and pipe each cupcake with a swirl. 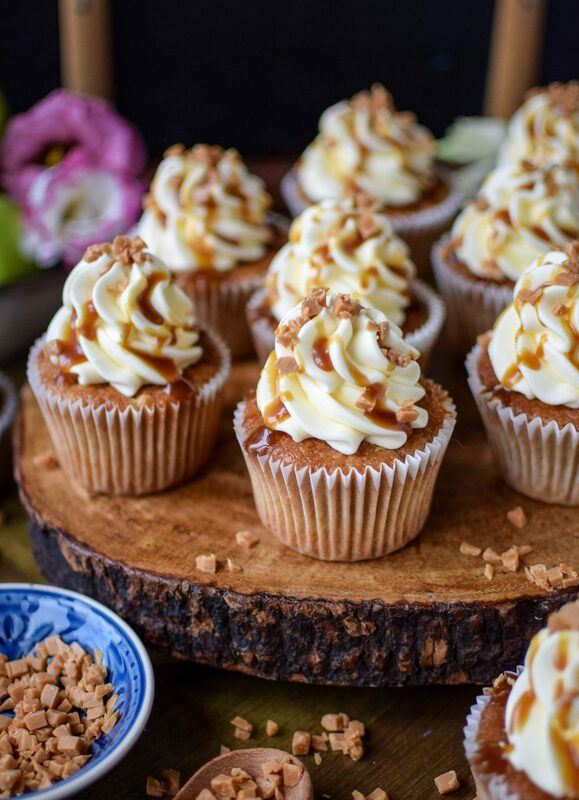 Drizzle each cake with some caramel sauce and chopped toffee pieces. The un-iced cupcakes freeze perfectly for up to 3 months. Simply remove them from the freezer, allow to defrost at room temperature for a few hours then frost as normal. These look so tasty and yummy. I might have to print out this recipe for my daughter to try. 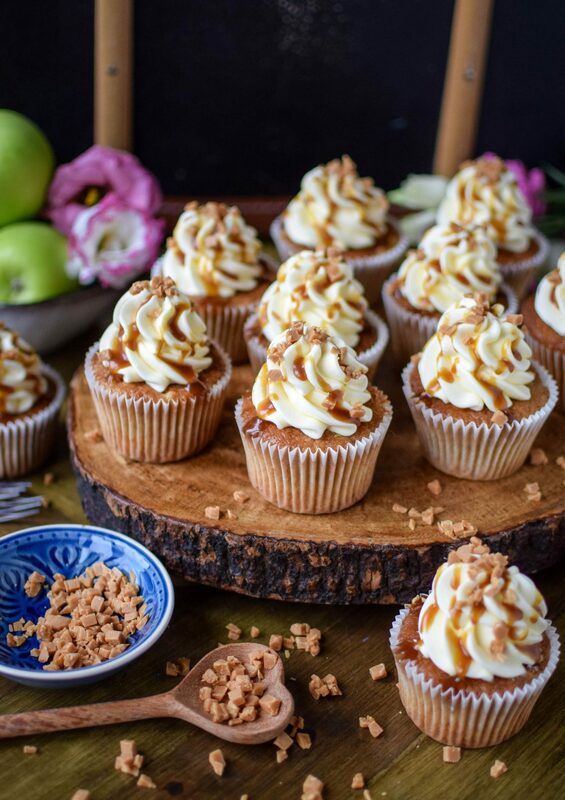 Oooh yum yum, I love how cute these caramel apple cupcakes look, I have not made cupcakes in months and now wanting to create something more autumn. wow these look amazing and perfect for our little Halloween party we might be having! Oh wow! They look lush. Anything with caramel ticks the box for me! These look amazing and so easy too. Yum! !